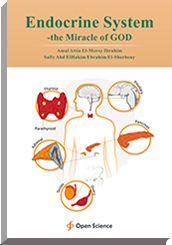 This booklet introduces the brief information about the endocrine system in human body. This system represents a miracle from GOD in releasing, working and its final effect. Hormones are released into our blood in very small amounts. Timing of hormone release is often critical for normal function. This is especially true during fetal and plant development. Precise hormone control is important, as too much or too little at the wrong time can result in dysfunction of one or several body systems. Any adverse structural and/or functional changes to the endocrine system, which may result from exposure to chemicals, can harm human and animal growth, reproduction and development. This book contains also the organs that do not belong to the endocrine system, but at the same time the secret hormones. Amal Attia El-Morsy Ibrahim, Associate Professor of Histology and Histochemistry, who worked at Zoology Department, Faculty of Women, for Arts, Science & Education, Ain Shams University, Cairo, Egypt. Now she acts as the Head of Biology Department, Faculty of Science for Girls', Northern Border University, Ar'ar, KSA. Beside her original fields in histology and histochemistry, she is also interested in many diseases like cancers, immunohistochemical staining to detect the different subtypes of cells and proteins inside tissues and exploring the immunomodulatory effect of natural herbs to avoid dangers by therapeutic drugs. She participated in many applied science projects to serve the community. She is a member in many scientific committees, a reviewer and editorial member in many international journals. She has published many scientific books about biology, experimental biology, animal and plants as antioxidant natural resources besides food additive field. Sally Abd ElHakim Ebrahim El-Sherbeny, Lecturer of Animal Physiology, Mansoura University, Dakkahlia, Egypt, who works at Biology Department, Faculty of Science for Girls', Northern Border University, Ar'ar, KSA. She has published many scientific articles and a scientific book about food additive field. School students, undergraduate university students and young scientific researchers.